Yes… the Big Bay Swim is only weeks away and They have extended the early bird registration to the 10th February. This is their 30th Anniversary swim and they are encouraging even more swimmers to tackle the challenge of swimming across the bay. Given the unfortunate cancellation last year due to dangerous conditions they have a second course in more sheltered waters in the event we need to shift. This will virtually guarantee that all future swims will proceed regardless of trying water conditions. 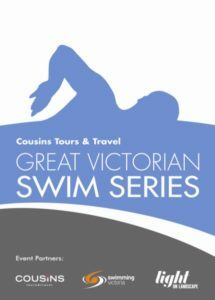 The swim will be supervised by members from the Williamstown Lifesaving Club, using Surfboat IRB’s & Lifesavers on boards. Proceeds from this event assist the Rotary Club of Point Gellibrand, Williamstown to continue their important charity work with causes such as the Challenge Cancer Support Network – Supporting Kids with Cancer and the 20th Man Fund.